The High Tatras or High Tatra Mountains are the smallest alpine type mountain range on the planet with a unique endemic fauna. Among these, one of the most prominent example is Tatra chamois that became a symbol of Tatra National Park (TANAP). 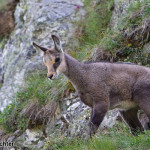 The Tatra chamois (Rupicapra rupicapra tatrica) is an endemic subspecies of the chamois of the Rupicapra genus (Rupicapra rupicapra) living only in High Tatra and Low Tatra Mountains (where it was artificially introduced between 1969 and 1976). 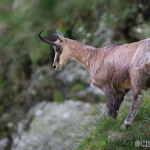 Like all mountain goats, chamois are also well adapted to life on steep rocky terrains. Adult males are taller (70 – 80 cm) than slightly more gracile females. Chamois horns are short and the tip pointed slightly backwards. Their dark fur becomes lighter in winter times. Facial fur is light with prominent dark stripes below eyes, black strip along the back and whitish buttocks. They graze mainly on herbs and lichens. Their life span is approx. 20 years. Females and with calves create small herd, while adult males prefer solitary life throughout the whole year. Chamois rut starts at the end of October. Dominant males create a harem of 20 – 30 females, ferociously protecting it from other suitors while constantly checking their mating readiness. This time of the year provides spectators with a unique opportunity to observe breathtaking fights between males, hitting their horns with thundering sounds echoing in nearby valleys. characteristics: Our trip will take us to Tatra National Park (TANAP). The oldes national park in Slovakia, established in 1949, protects the area or Slovakia’s highest mountain range – High Tatra Mountains, which is also the highest part of Carpathian Mountain Range. We will be situated at the altitude of approx. 1250 m, walking in spruce tree, alpine pine and alpine meadow level. Because many parts of the Park suffered from 2004 tempest, we will, between chamois observation, talk also about broader ecological relations of TANAP’s nature. Route is difficult one with length of maximum 21 km and superelevation of maximum 1600 m. It will lead on walking paths throughout the whole time. Trip may be adjusted according to snow thickness and actual animal occurrence. Important notifications and conditions: Participants undertake the trip at their own risk. Tour operator does not provide participants with specific tourist insurance. 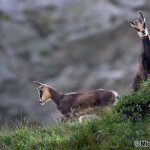 Tour operator provides professional guiding and gear to observe chamois and others. Chamois will be observed only from, or close to, footpaths. Because of their conservation status (endangered species), it is very important NOT to disturb them beyond a very limited level. We do not recommend participants to be accompanied by children below 10 and/or dogs.